When you see Carolyn Sibert you can't help but notice her beautiful smile that engages her entire face. 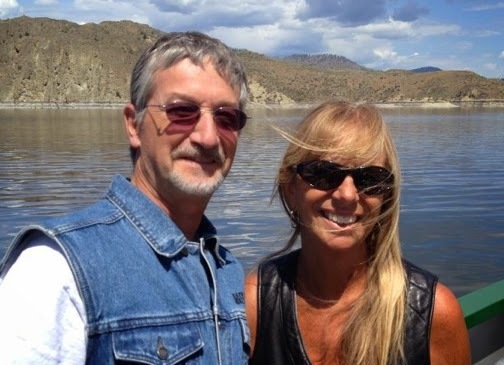 Whether she's hiking, hitching a ride on her husband George's Harley, or hanging out with any or all of her eleven grandchildren, Carolyn gives herself to what is before her. She loves life, with all its joys and challenges. And Carolyn has had more challenges than most folks. The youngest of nine children, Carolyn was a strong-minded girl -- she calls herself strong-willed -- and lived in her own world. Sometimes she disobeyed. It wasn't until she was five years old that her parents discovered the reason: She was profoundly deaf. So was her brother, who was eleven years her senior. 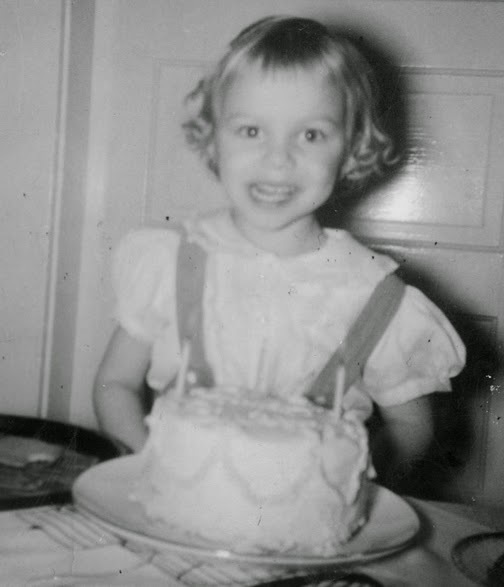 Her first hearing aid was a transmitter box that she wore on her chest, with a coil to her ear, a bulky oddity on a little girl. It embarrassed her and sometimes she would take it off. With the encouragement of her family and a good speech therapist who travelled 250 miles roundtrip over the mountains twice a month to work with Carolyn and several other students at her school, she made good progress. 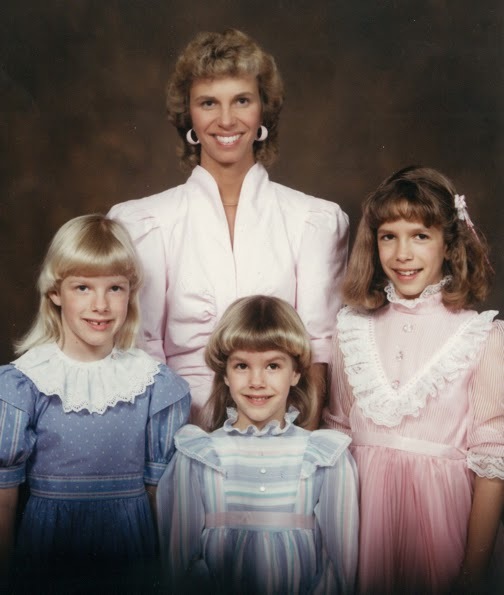 She married in 1974, shortly after graduating from high school, and within a few years she was the mother of three young girls. But all was not well. The brother who was also deaf was diagnosed with Retinitis Pigmentosa, "a rare, inherited disease in which the light-sensitive retina of the eye slowly and progressively degenerates," resulting in eventual blindness. Because it is hereditary, each of the siblings was tested for it. Only Carolyn was found to have the disease. It was more than her husband could handle. After twelve years of marriage he left her to figure out things on her own. Through Divorce Recovery, a weekly support group at her church, Carolyn found two things that changed her life. One was the amazing support that this program offered her. The other was George, a wonderful friend who eventually became her husband. They married in 1989. Carolyn got a job as an account assistant at a window company. She loved the work and prided herself in her ability to cope with her diminishing vision. Actually, she was in denial, refusing to use a cane or any other assistive technology. After all, she told herself, she could still see to read and drive. But by 1999 she could no longer even do that. Angry and grieving the loss of her independence, Carolyn turned over her car keys to George. She became dependent upon the bus system to get to work and other people to help her do things that used to be routine. Then her company closed. With no job, she fell into depression. This highly capable woman, who already had survived many hardships in life, did not want to be identified as a blind person. Carolyn's church began to pray. "Lord, help her come to terms with her blindness and find your purpose for her life." He answered by sending her to school. When she began the six-month program at Washington State's Department of Services for the Blind Occupation and Training Center in South Seattle, Carolyn was angry. "I was like Helen Keller," she says, "except that I wasn't mute! I was resistant, angry, and devastated. But with the love and support of my family and church, I began to thrive in the program." Within a couple of months she was using assistive technology and finding her way around in downtown Seattle, cane in hand, regaining her confidence, her independence and her self-worth. In retrospect, she says it's the best thing that could have happened to force her to deal with her disability. With her training she qualified for a job at Seattle Lighthouse for the Blind, the largest manufacturing company in the country to hire blind and blind/deaf individuals. By implementing assistive technology she was able to get a job as an account assistant, doing the same kind of work she had done before. "In society people are afraid to hire folks who are blind," says Carolyn. She knows first-hand that the visually impaired can learn skills that equip them for independence in their personal lives and in the marketplace. 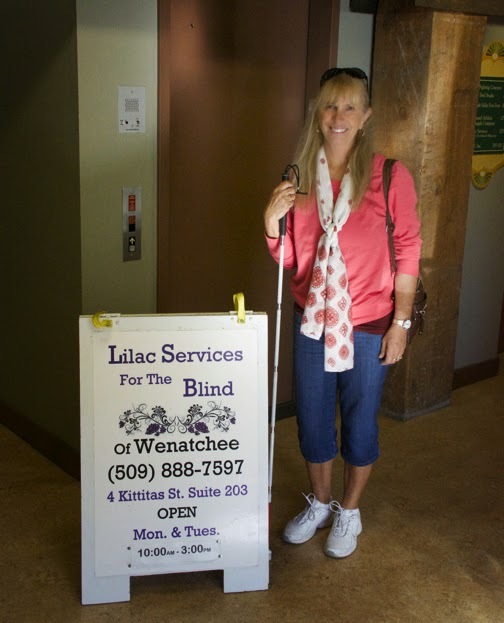 Today she is the Office Manager of the Wenatchee branch of Lilac Services for the Blind. 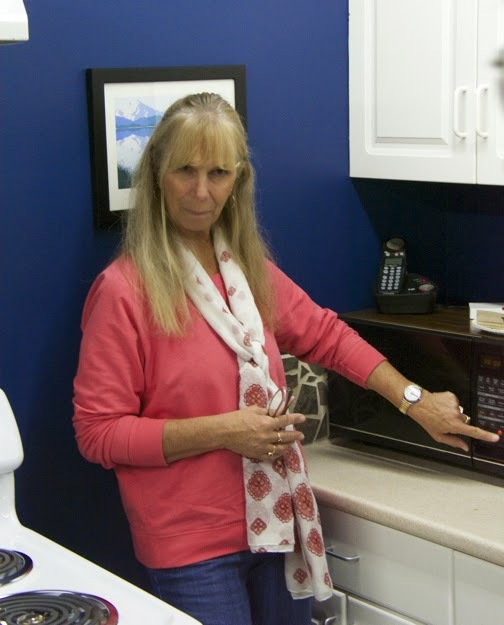 She love her job, especially the opportunities to work with men and women in Central Washington who are learning adaptive skills to deal with their vision loss. 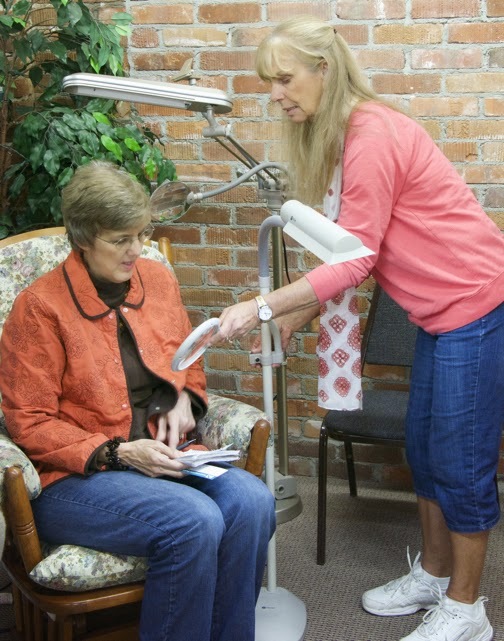 Not only does Lilac Services provide assistive technology. 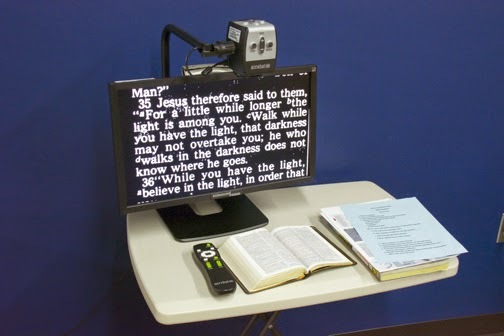 such as CCTV/video (closed-caption), magnifiers, reading lamps, clocks that say the time, and software to make life manageable, they also have a fully-equipped adaptive kitchen (raised red dots serve in place of traditional buttons), a weekly "low vision" clinic, and one-on-one training and counseling, as well as support groups to assist the visually impaired live more independently and confidently. Carolyn Sibert would be the first one to tell you that she is weak. Yes, she has overcome many obstacles, but not without help. She has had practical training and she has had the support of family, friends, and many others along the way. But she would want you to know that it is the Lord who has taken her through her difficulties and has made her strong in His strength. And she would want me to encourage you to let the Lord use the weaknesses in your life to lead you into His strength Then use what you learn through the experience to serve others. Not only will you be a blessing, you'll also be blessed.